Once upon a time, a young girl stitched a sampler on gauze. It must have been meaningful gauze — the placard on the museum wall next to this framed needlework said it was gauze leftover from her family's care of a wounded Civil War solder. Romance makes me wonder if she was in love with this boy, and stitched her sampler on something that would remind her of him. Or maybe, she just wanted the medium, the finely woven canvas mesh on which she could achieve amazing detail for her palette of stitches. If so , she wouldn't be the first or the last to stitch on gauze. Silk gauze — canvas mesh made of 100% pure silk thread — has been used in clothing, jewelry, embroideries and other textile work for centuries. Today it is common for miniaturists to use silk gauze for to-scale reproductions like rugs, miniature pillows and samplers. Silk gauze comes in different holes-per-inch sizes, so with 40-count silk gauze, for instance, you get 40 holes per inch, and a perfect 1-foot to 1-inch scale. Other needle artists use silk gauze as an alternative medium and for creating intricate needlework. One silk gauze embroidery designer we are excited about is Patricia Parra. 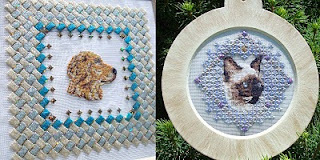 She has taken Kreinik silk gauze kits and added stunning specialty-stitch borders. Her particular use of decorative stitches creates more three-dimensional looks on silk gauze. When she uses Kreinik's holographic threads on silk gauze, her designs look simply magical. A native of South America, she has had an interest in needlework since she was a child. Her mother was a clothing designer so she has always been exposed to color and design. Patricia opened a San Francisco needlepoint store in 2005 and started teaching and creating stitch guides. In 2007 she discovered silk gauze and fell in love with the delicate work. Her silk gauze patterns include traditional themes as well as contemporary geometrics using specialty stitches and lots of color. Patricia often loans us her silk gauze models to take to shows, and we are excited to share photos here. • Check with your needlework store for other artists creating silk gauze designs. Erica Michaels Designs, for instance, has a new line of "Petites" silk gauze kits, http://www.ericamichaels.com. I was "summer cleaning" this weekend, going through organizers full of quilt, cross stitch, crochet, sewing magazines and patterns that I've collected over the last 20 years of serious crafting. My intent was to get rid of a large portion of them: I don't have enough house-space to display all of the projects even if I could actually finish them; I haven't been able to finish anything or invest time in these lately; and those "hoarding" shows on TV would want me to move these things. Well, I am too embarrassed to admit how little I managed to hand over to my Frugal Self. Unfortunately, I fell in love with making things all over again. So next on my to-do list is dedicating time for actually making these wonderful patterns I've collected (and get more projects/fabrics/notions when I attend Quilt Odyssey with a friend this coming weekend). Now I remember why I love stitching and sewing: it's relaxing and stimulating at the same time. The focus and process of needlework is an escape (the health benefits have even been documented). It's my meditation (I never could master the sitting-still "om" version). It's also liberating and creative. The threads and designs are so pretty and colorful, it's like they are bringing life to the fabric. It is making something out of nothing, or out of scraps. None of these benefits are a waste of time. 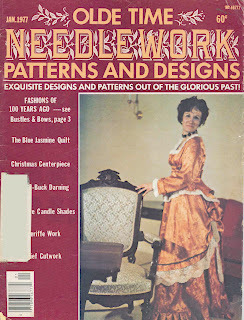 One of the magazines unearthed in my pile was "Old Time Needlework Patterns and Designs, January 1977" (sixty cents?!) passed to me from a great aunt. 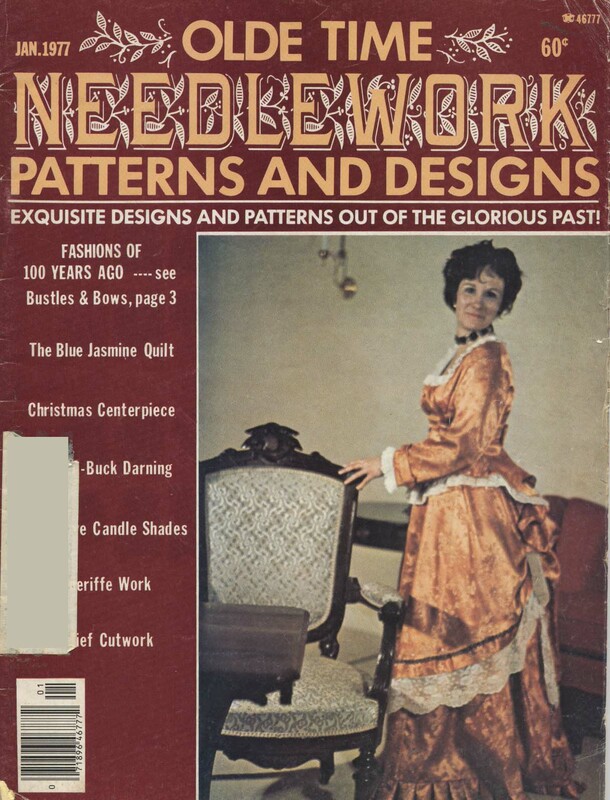 Editor Barbara Hall Pedersen posed a question in her column: "We cannot look thoughtfully at the needlework produced by the women of past generations without asking ourselves a question. What force in their lives was so powerful that it could motivate them to invest the countless hours of their time necessary to produce such exquisite examples of needle art?" She went on to write, "Was it essentially a quest for beauty? Did they do it out of pride, or possibly an excess of leisure? Did virtue demand that every idle moment be occupied? It may have been all of these things, but I believe that it was also something much more. Each of us, deep down, yearns to leave some sort of mark upon the world, as proof that we have passed this way. In a time when a woman did not even have the vote, when she was forced to transact business behind her husband's name, when her opinions counted for little and her authority extended only to the home, women refused, even then, to see themselves as insignificant. They seized whatever avenues were open to them as a means of self-expression." Ah, self-expression. Yes, I stitch because of that, and I bet you do too. Stitch your sayings, make your mark, don't stop working your projects. The threads, the designs, the fabrics...it's a beautiful world out there, and we are all making it happen. My wife, Myla, and I decide to hit the road and travel north. Neither one of us had ever been to Lake Superior, so to us it would be an adventure. We are both interested in history and food, so we wanted to see why people settled in the "UP" (Upper Peninsula) and the type of foods they find to consume. First, let me tell you about the food. 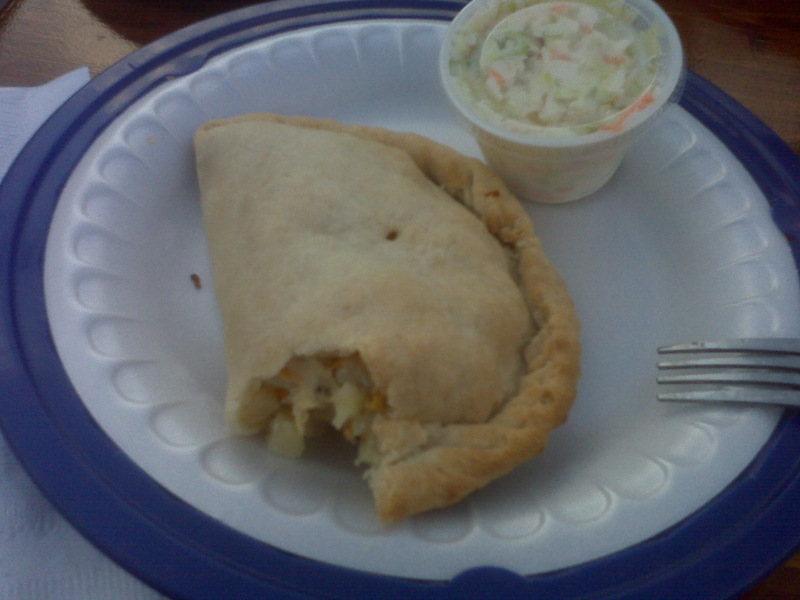 Pastys (rhymes with “nastys”) are a popular food. We tried pastys made with beef and chicken. Myla barely dipped hers in ketchup but swathed it with butter, as recommended. She also tried the beef with gravy. I prefer chicken. To me, it tasted like chicken pot pie the size of a large empanada. The delicacy comes from Wales where there was a lot of mining. The miner would take the food into the mine, and at meal time, place on a shovel or in a helmet and heat it with his candle. It is now available in beef, chicken or vegetarian. There is also a lot of fishing in that area, and the Ojibwa have the fishing rights and supply much of the coast with fish. We imagined that we would eat broiled or barbequed fish, but fried fish with tartar sauce was the main course. Desserts were plentiful with a variety of fruit or nut pies. Along the way, we took in a lot of sites. We visited with friends in Toledo and Detroit. We even had a personal tour of the Episcopal Cathedral in Detroit — a real gothic classic. In the Lower Peninsula we went to the National Cherry Festival in Traverse City. We enjoyed tasting all sorts of jams, salsas and barbeque sauces made with cherries including a cherry pizza. 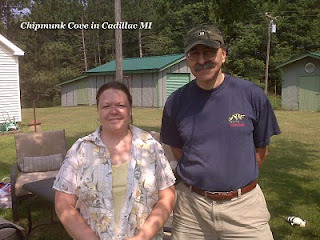 I stopped to visit two Kreinik thread customers along the way. 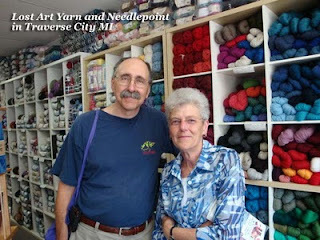 Lost Art Yarn and Needlepoint is in Traverse City, and Chipmunk Cove is in Cadillac. 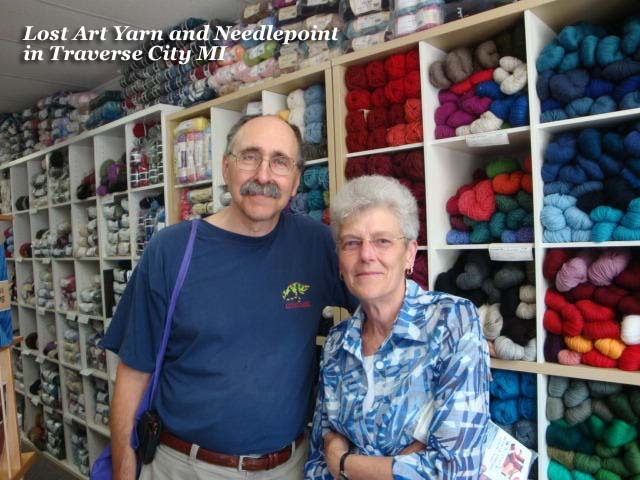 The shop in Traverse City is right downtown and is filled with knitting and needlepoint. They had a steady flow of stitchers and knitters going through this destination. Gerhild gave me clues as to where to get the best price on dried cherries in the area (Michigan grows more cherries than any other state). Chipmunk Cove is more of a mail order shop. She has classes and has quite a following. Judy cut fresh broccoli from her garden for us to chomp on during our trip. 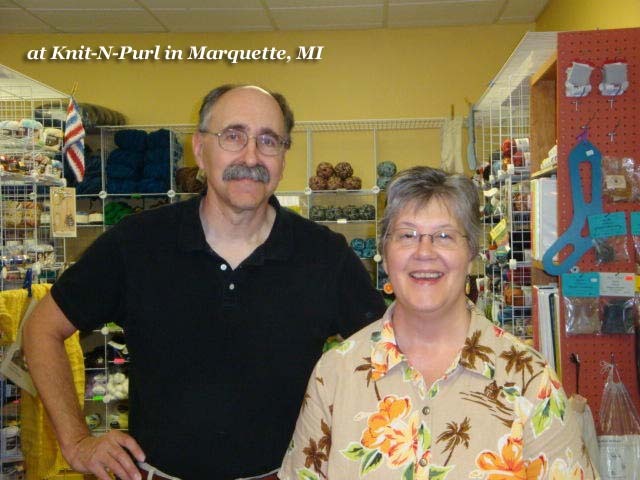 We also visited with Paula Schwenke at Knit-N-Purl in Marquette. She has a really nice little shop that has a long history. She services knitting and cross stitch with lots of classes for adults and kids. We plowed through the Sault Ste. Marie locks museum and did have a broiled fish dinner at the Lockview. Sault Ste. Marie is the third oldest city in North America. We traveled through Paradise to get to Tahquamenon Falls near Newberry. The water is brown from the tannic acid from the piney woods. It was loud and beautiful. In Munsing we took the boat tour and saw the Picture Rocks, a 12-mile stretch of cliffs and waterfalls carved out by the ferocious seas. Many ships have gone down along the coast. This city butted up against the Hiawatha Forest. I found out that Lake Gitchee Gumee is Lake Superior. The water is so pristine that you see the bottom. We traveled up through Marquette to the Keweenaw Peninsula and ate muffins and purchased Thimbleberry Jam at the Jam Pot. This place is owned and run by the monks. They built a large church right on the water near Eagle Harbor — very peaceful. The muffins were incredible. We stayed in Copper Harbor on the coast in a 50’s style motel. In the morning we were serenaded by the loons and song birds. We went to the top of Brockway Mountain four miles from Copper Harbor, named for the massive reserves of copper that used to exist here. The mountaintop gives you a 360-degree vista of the surrounding mountains and the Lake. It is breathtaking. Calumet is still large. It originally was to be the capital of Michigan, but the politicians rethought the proposal. There are lots of mining activities all through the area. In Gladstone, we toured a pet casket company. My son is going to mortuary school and asked us to pick up some brochures. Myla’s Iphone Apps were always giving us strange places to visit or view including "Paul Bunyan" who was visible everywhere, built out of paper-mâché, some being 30 feet tall. After crossing the Northern shore of Lake Michigan, we found the best pastys on the trip in St. Ignace at Bessie’s, and then the next morning at the Mackinac Pasty and Cookie Company in Mackinaw City. Smoked fish also found our palettes, and it was delicious. The white fish was superb. Following the blue waters of Lake Huron, we drove along the coast to Port Huron. This city has many nice eateries. One notable place is the Raven Café with its walls of books, fine foods, folk singers, and hearty coffee and desserts. In the morning we swept through the corn fields of Windsor Canada, and then homeward bound to West Virginia, first stopping at my favorite Greek restaurant in Columbus, the “Happy Greek”, and then to Jeni’s for sorbet. We drove over 2000 miles, saw an amazing landscape, learned new expressions like “Yooper” (someone from the UP), ate thimbleberry jam and pasties, and had a wonderful adventure. Kreinik will be shutting down all of our sales/marketing/manufacturing operations to enjoy a week of vacation following July 4th and will re-open July 10. For 4th of July weekend my mother-in-law reminded me to bring my ice cream maker with me. I have an "off the hook" recipe for Philadelphia Style Vanilla Ice cream. The recipe is ridiculously simple to follow and the results are downright sinful. I have friends who refer to this as "Silk" (we never stray too far from threads) as it is so smooth and creamy. I got this recipe from the book "The Ultimate Ice Cream Book" by Bruce Weinstein. Its been a family favorite ever since. Place heavy cream in a sauce pan and heat (do not boil) until you start to see small bubbles appearing around the edge of the pan. You only need to get the cream hot enough to dilute the sugar. When hot enough, turn off stove, and stir in the sugar. Allow the cream/sugar mixture to cool for 10 minutes before stirring in the vanilla. Place mixture in the fridge for a few hours to cool completely. 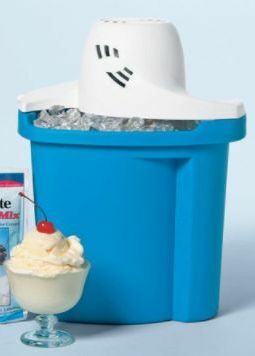 Add the chilled mixture to your ice cream maker. Back in the old days we used to have to hand crank this stuff out. Not anymore. I use a Rival electric ice cream maker but any machine will do. Follow the makers instructions for setting up your machine. After about an hour, the ice cream is done. 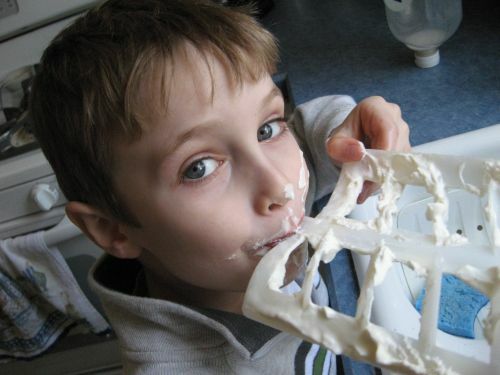 My son gets first dibs on the beater when I'm done. Fresh out of the maker, a good bit of the ice cream is just like soft serve making it easy to make some ice cream sandwiches. I like to put this on top of some freshly baked brownies to make brownie sundaes. (Sorry, no calorie counting here.) Perfect for get-togethers, holidays or really hot summer days.